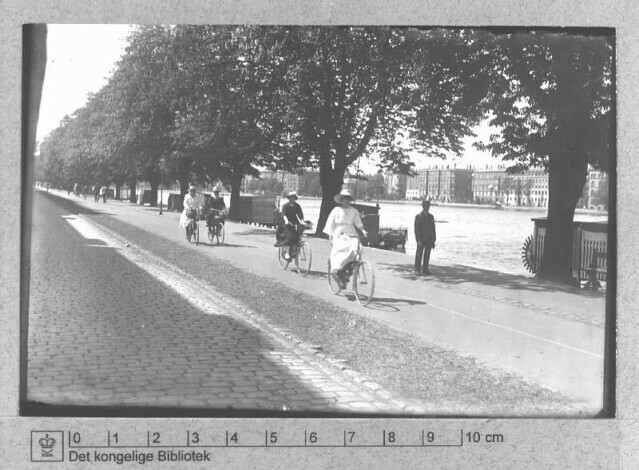 We have covered the historical aspects of Danish bicycle infrastructure before here on our blog, including the first cycle track in the world in 1892 on Esplanaden in Copenhagen. There is always space for more lessons from history. Above is a photo from Copenhagen in 1911. 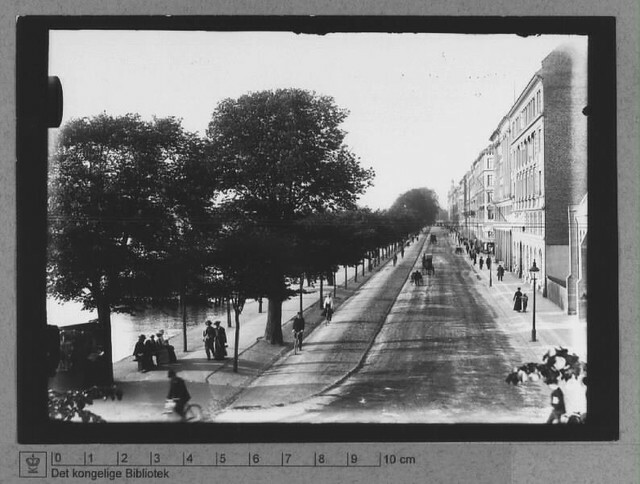 The streets along The Lakes in Copenhagen were the busiest for bicycles in the entire nation around the turn of the last century. The conditions for cyclists, however, left much to be desired. The swarms of cyclists only had a narrow edge of a riding path to use. The Danish Cyclists' Federation, founded in 1905, demanded a cycle track on the route. The city's horse riders refused to relinquish space. In an early example of the power of data related to traffic, a traffic count was done in 1909. It turned out that 9000 cyclists were counted each day, but only 18 horse riders. That changed the conversation. A three metre wide cycle track was put into place in 1911. It was bi-directional, as you can see on the above two photos, but we hadn't yet figured out that bi-directional was a bad idea on streets. At the time, it was good. Now we know better. I found the above photo in the City's archives a few years back. 1915 was scribbled on the back. I have been waiting for this calendar year to cycle out to the Østerbro neighbourhood to photograph the same spot. I did so last Sunday, on a quiet afternoon. 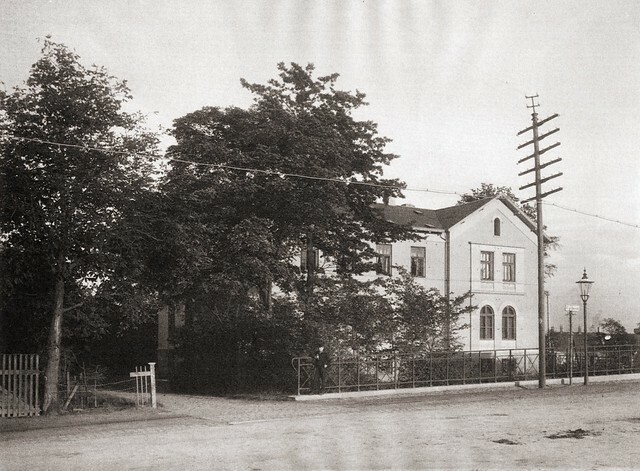 Same spot as in 1915. This stretch features 20,000+ cyclists a day today. This photo is from farther outside the city, in 1955. These cyclists in the morning rush hour are heading for the stretch in the previous photo, on the other side of the street. 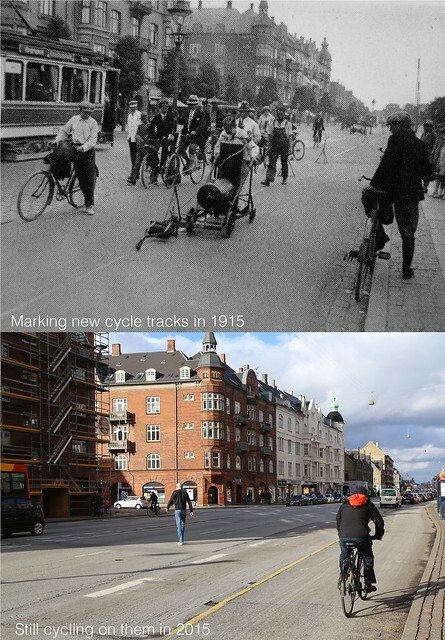 The need for a cycle track as obvious in 2015 as it was in 1955 and 1915. While I was in the neighbourhood, I took a photo at the same spot as the photo, above. On Østerbrogade, next to The Lakes. Wider cycle track back in the 1930s, but not by much. 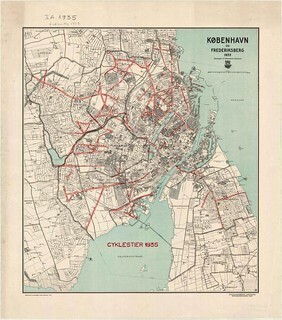 On the left is a map from 1916 of the bicycle infrastructure in Copenhagen and Frederiksberg. 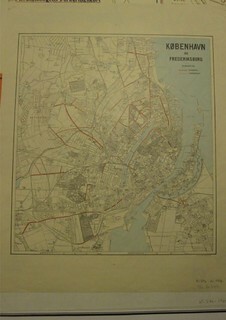 On the right is a map of the same from 1935. 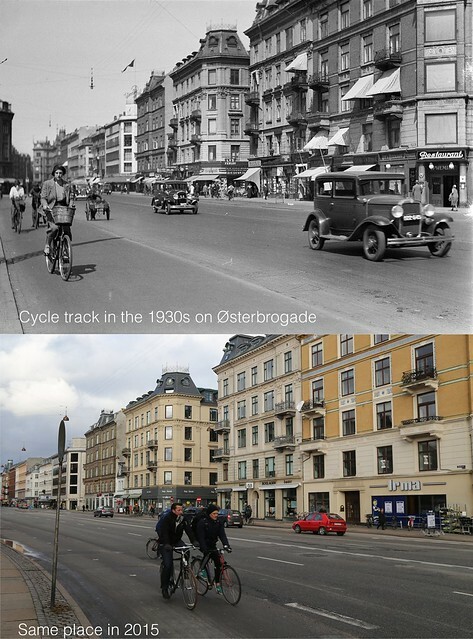 Compare this to Helsinki, which also had a great network of cycle tracks in 1937, like so many other cities. 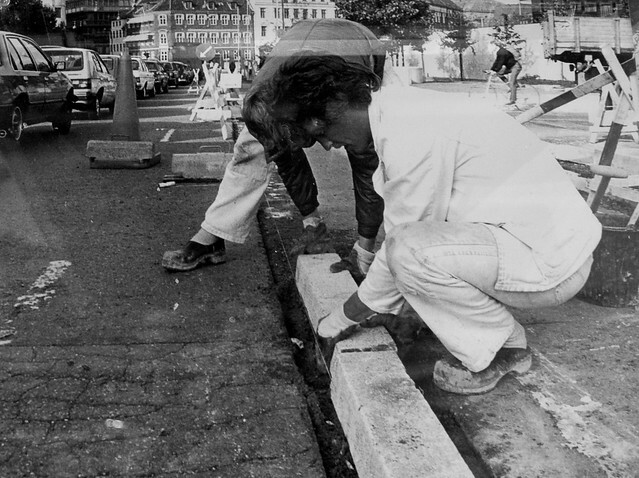 We know that much bicycle infrastructure was removed in the urban planning brain fart that was the 1950s and 1960s. There isn't a lot of information about how much and where. We do know that the modal share for bicycles in Copenhagen plummeted from a high of 55% in 1949 to single digits in 1969. This is a photo from Svanemøllen, north of Copenhagen, in 1899. What is interesting about this is that the sign at right reads "Cykelsti" - "Bike Lane". From the first dedicated facility for bicycles in 1892, it didn't take long to get official signage in place. 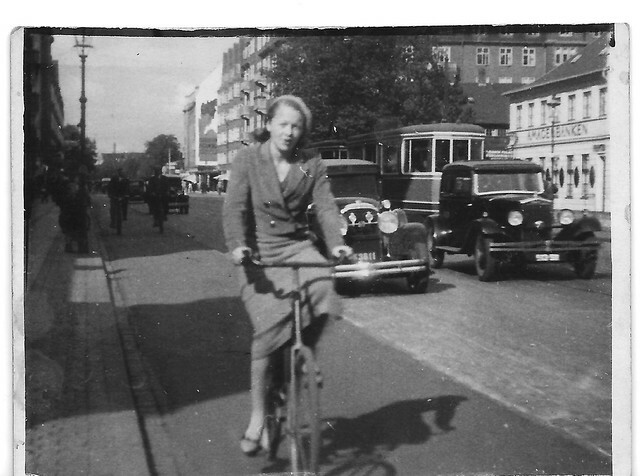 Another cycle track shot from the 1930s on Amagerbrogade. It was near here that the city starting putting physically separated cycle tracks back in, in the early 1980s. 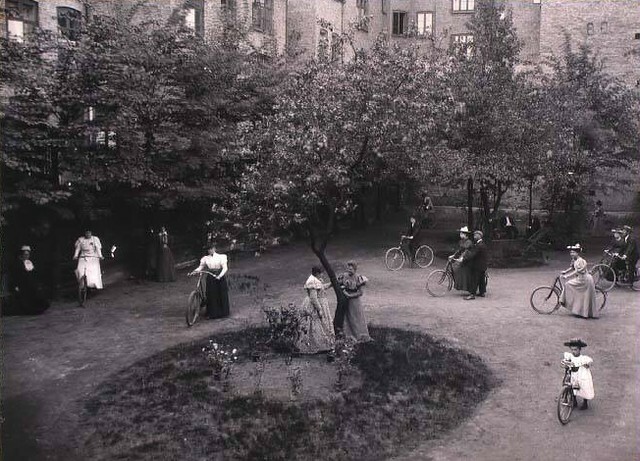 Finally, a photo of a bicycle school in Copenhagen in the late 1800s. Women learning the ropes of the freedom machine.